Since the demise of ‘Spartacus’ and the rather dismal and bland ‘Vikings’, there’s a void for violent historical action. Well, ‘Hammer of the Gods’ has certainly arrived on shores at a good time. Some of you may have seen this bloodbath at this year’s FrightFest and it’s entry on the roster proved its bloodthirsty welcome. For those who didn’t catch the violence, we have some good news. 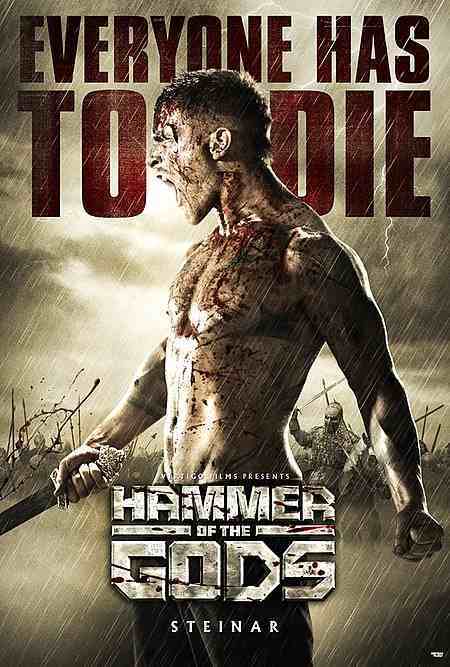 We’re delighted to announce that brutal Viking actioner, Hammer of the Gods, will come to DVD and Blu-ray on 2 September courtesy of Vertigo Films and Entertainment One. Starring Charlie Bewley (Twilight Saga, Like Crazy, The Vampire Diaries) and ames Cosmo (Game of Thrones; Sons of Anarchy; The Glass Man), and directed by Farren Blackburn (The Fades; Luther; Doctor Who), ‘Hammer of the Gods’ follows a young Viking warrior, Steinar (Bewley), who is sent by his father the king on a quest to find his estranged brother, who was banished from the kingdom many years before. Steinar’s epic journey across terrifyingly hostile territory with his most trusted friends and warriors, gradually sees him emerge as the man his father wants him to be – the ruthless and unforgiving successor to the throne.